His work again is surfacing. A new generation is discovering his brilliance. Public Buildings and inspiring spaces. From outside the color draws me like a beacon. When inside color washes over my body and it changes as I move from one place to another. I’m orange. I’m blue. When I chase the light and it chases me. That experience is the Montreal Convention Center. When I hear the words convention center I cringe. I have experienced many a convention center and they are uninspired spaces. They have very little if any energy of their own. Visitors come and go but the buildings and spaces created inside are dead except for the mechanical drone of HVAC or escalators. Some of the buildings focus are industrial, some monumental, others overgrown shopping malls. Why is it that our government buildings are so uninspiring? Is it our culture? Is it because we somehow think that our tax dollars and neighborhoods don’t deserve beauty? I think it is the process that we have for creating public buildings. The process is without inspiration or vision. 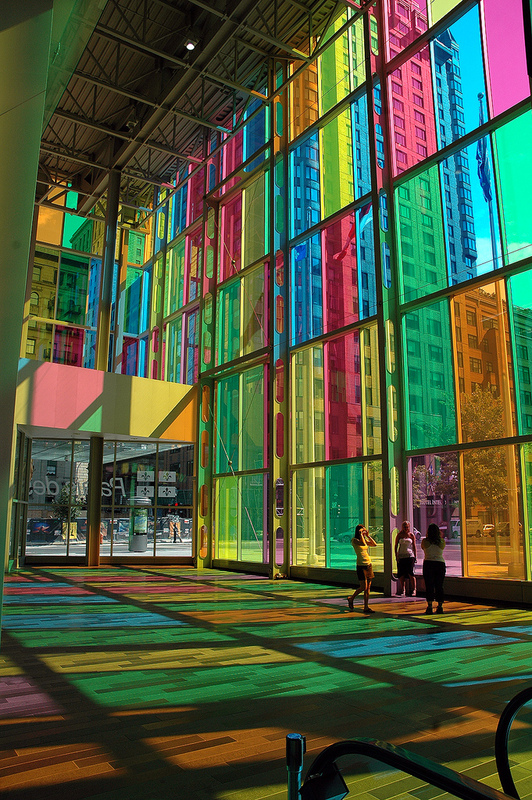 Montreal on the other hand had a marvelous vision and they have shared it with all of us. So thrilled he’s recording music again. Rock your soul. There is only one way to read, which is to browse in libraries and bookshops, picking up books that attract you, reading only those, dropping them when they bore you, skipping the parts that drag-and never, never reading anything because you feel you ought, or because it is part of a trend or a movement. Remember that the book which bores you when you are twenty or thirty will open doors for you when you are forty or fifty-and vise versa. Don’t read a book out of its right time for you. Saw this and had to share it. A wonderous time-lapse view of the vocanic erruption in Iceland, Eyjafjallajökull – May 1st and 2nd, 2010. The beauty and power of nature. Gravity makes rhythm. Makes me want to go out and draw. Of all the nasty outcomes predicted for women’s liberation… none was more alarming, from a feminist point of view, than the suggestion that women would eventually become just like men. Day two is a Sunday this year. I can remember as a kid using the distress call : MAYDAY, MAYDAY, MAYDAY to get help when our strategy games may have gone wrong. Mayday is an emergency code word used internationally as a distress signal in voice procedure radio communications. It derives from the French venez m’aider, meaning “come (and) help me”. It is used to signal a life-threatening emergency by many groups, such as police forces, pilots, firefighters, and transportation organizations. The call is always given three times in a row (“mayday-mayday-mayday”) to prevent mistaking it for some similar-sounding phrase under noisy conditions and to distinguish an actual mayday call from a message about a mayday call.